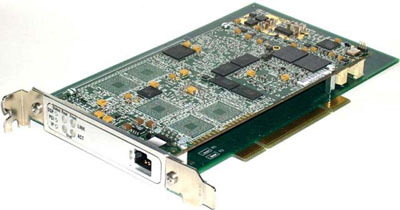 The SigC5561 PCI/PCIe card utilizes Texas Instruments / Telogy TNETV3010 DSP devices to provide a high-density, low-cost packetization engine for Asterisk™ IP PBX and open source VoIP systems. The TNETV3010 device yields a high ratio of channel capacity to cost and board space, providing up to 192 channels per device including full 128 msec echo cancellation, multiple voice codecs (see list below), G.711.1 packet loss concealment, VAD, CNG, DTMF functions and RFC 2833 relay, jitter buffer, and more. 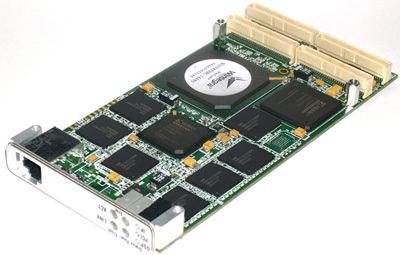 The SigC5561 card complies with HMP (Host Media Processing) architecture and allows transfer of both tdM and packet data over PCI/PCIe bus, providing a hardware engine for PC-based media gateway, softswitch, and transcoding server applications based on open source VoIP software. Channel capacity scales from 192 to 2304 G.711 (PCM voice), 96 to 1152 G.729AB or iLBC, and 72 to 864 G.723 or GSM-AMR channels. The SigC5561 board may also be used in ATCA, cPCI, VME, and other infrastructure platforms. Click here for more information about non-desktop PC configurations of the SigC5561 card. Voice codecs, echo cancellation, and voice quality monitoring are good examples of "DSP real-time processing" performed far more efficiently and at far lower cost using the SigC5561 card than using server arrays based on multi-core x86 processors. At higher channel capacities, for example 120 or more, adding one or more SigC5561 cards triggers a cascade of cost savings, eliminating Lbr codec IP/royalty fees, reducing electric and cooling costs, and reducing required physical space. In effect, each server is maximized for efficiency and the waste and high cost caused by "motherboard farming" is eliminated. In a typical VoIP application, the SigC5561 card processes tdM channels of 64 kbps PCM (G711) voice, fax or data traffic. Voice data is optionally compressed via G729AB, G723, GSM-AMR, EVRC, iLBC, or other Lbr codec. In addition, the SigC5561 card provides RTP, RTCP, or T.38 packetization of voice and fax data, and a comprehensive range of voice and data telephony functions. In a typical transcoding application, the SigC5561 card transcodes between one type of Lbr codec and another, for example between G729AB and G723, or G729AB and GSM-AMR, using embedded logic on the board to allow internal PCM loopback and framesize adjustment. Mixed VoIP and transcoding applications are supported. For advanced applications, an optional WinPath network processor provides packet formatting, segmentation, reassembly, and routing functions directly on the SigC5561 card, without host intervention, including direct GbE or 10/100 interfaces to RJ-45 connectors. Separate multi-FSX/FXO, multi-T1/E1 or T3 PCI card(s). In this case, tdM data is transported on the PCI bus, between cards. Providers of T1/E1 and T3 cards include Digium, Sangoma, SBE, and more. This method is the least expensive and most flexible, but experiments show that reliable operation is limited to about 500 or so tdM channels over the PCI/PCIe bus on 32-bit PCI/PCIe motherboards. Unified multi-T1/E1 or T3 card. 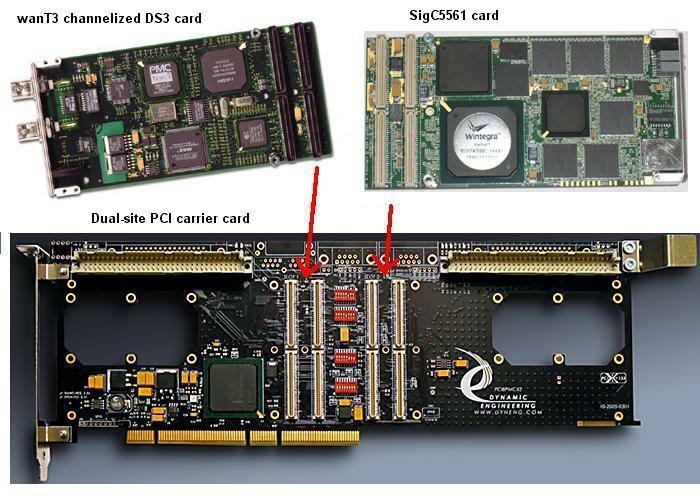 In this case, the SigC5561 and another PMC form-factor card are combined on a dual site PCI carrier card, which allows tdM data to move between the two cards without PCI bus interaction. A typical dual carrier card configuration would combine a SigC5561 card and a wanT3 channelized DS3 card. The dual carrier method allows higher channel capacities due to direct inter-card tdM communication, free from impact of system activities involving the PCI/PCIe bus. tdM channel capacities up to 2048 full-duplex channels are possible per SigC5561 card. tdMoIP protocol. tdM-over-IP protocol, also referred to as CESoPSN, may be used. In this case, tdM data is transported on the GbE interface to the SigC5561 card, where it is "interworked" by the WinPath network processor into tdM format data and routed to the tdM side of the DSP farm. tdM channel capacities up to 2304 full-duplex channels are possible per SigC5561 card. Below are VoIP features included with all configurations of the SigC5561 card. IP Termination -- support for IPv4 (including TOS, TTL, header processing). Asterisk software support includes Linux drivers and install scripts. For open source VoIP and application-specific programming, DirectdSP software is available that allows host C/C++ programming interface to the card. WinXP and Win9x drivers and Win version of DirectdSP software are also available. The SigC5561 card may also be used with applications other than Asterisk; the C5561 card driver and API fully support user-defined application software. The table below gives channel capacities for available configurations of the SigC5561 card, including 2 DSPs, 7 DSPs, and 12 DSPs. Note that all channels include 64 msec echo cancellation. The table below gives IP-to-IP simultaneous call figures assuming one call leg is G.711. "IP-to-IP" is typically referred to as transcoding. Note that G711 leg includes 64 msec echo cancellation, if required by the application. Below are specifications for the SigC5561 card. All specifications are subject to change.